Gospel for Asia and ECFA: Is Reporting Information About An Organization Harassment? Gospel for Asia has not answered any requests for information from me since May 7. GFA’s COO David Carroll told me my questions had become too frequent and numerous for them. Former donors have also asked many of the same questions I have asked. Many former donors have written to tell me that GFA representatives said the Evangelical Council for Financial Accountability advised GFA not to talk to me. I have seen evidence that GFA is internally telling staff that they refuse to answer questions from me at the advice of ECFA. That would not be surprising since ECFA has not responded to my questions for months. 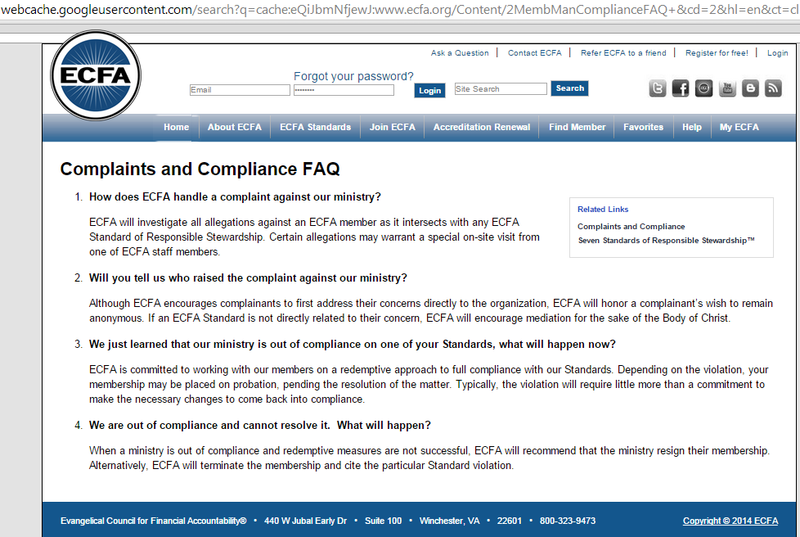 If indeed ECFA is advising a member organization not to answer questions from me, what could be the reason? I will address a possible rationale in a moment. However, before I do, it is worth asking GFA publicly: why won’t you answer questions from donors? Former donor and Canadian pastor Bruce Morrison asked you many questions about discrepancies between U.S. records and Indian reports. You didn’t answer them. He and his church supported GFA for 20 years. Former donor and blogger Jimmy Humphrey supported GFA for years until recently. However, he told me you didn’t have any answers when he wanted to know why discrepancies exist between U.S. and Indian records. GFA sent him a form letter but no specific answers. I have heard similar stories from over a dozen former donors; some of them are posting at the Phoenix Preacher blog (see the comments section of this post). The ECFA has a guideline called Transparency. Generally, it encourages organizations to be open about their dealings and specifies that ECFA member organizations must provide an audited financial statement upon request. GFA provided me with a copy of that statement when I asked back in April. This is the one area where compliance with ECFA guidelines has been advantageous. If the ECFA sticks by its own rules, the 2014 audited statement should be available soon because it was due to be filed with ECFA by July 31. An aspect of the Transparency guideline gives a member organization a loophole for disclosure of the audited statement. If the organization deems that the request is part of a harassment campaign, then the group is exempt. In ECFA speak, this exemption applies to requests for audited financial statements and is based on IRS guidance about disclosure of a tax exempt organization’s 990 form. Since tax exempt groups are supposed to operate for the public benefit, public accountability is served by the government requiring non-profits to file a disclosure of income and expenses via the 990 form. However, GFA doesn’t file a 990 since the organization is considered a religious order by the IRS. § 301.6104(d)–3 Tax-exempt organization subject to harassment campaign. (a) In general. If the district director for the key district in which the [26 CFR Ch. I (4–1–06 Edition)] organization’s principal office is located (or such other person as the Commissioner may designate) determines that the organization is the subject of a harassment campaign and compliance with the requests that are part of the harassment campaign would not be in the public interest, a tax-exempt organization is not required to fulfill a request for a copy (as otherwise required by § 301.6104(d)–1(a)) that it reasonably believes is part of the campaign. (b) Harassment. A group of requests for an organization’s application for tax exemption or annual information returns is indicative of a harassment campaign if the requests are part of a single coordinated effort to disrupt the operations of a tax-exempt organization, rather than to collect information about the organization. Whether a group of requests constitutes such a harassment campaign depends on the relevant facts and circumstances. Facts and circumstances that indicate the organization is the subject of a harassment campaign include: a sudden increase in the number of requests; an extraordinary number of requests made through form letters or similarly worded correspondence; evidence of a purpose to deter significantly the organization’s employees or volunteers from pursuing the organization’s exempt purpose; requests that contain language hostile to the organization; direct evidence of bad faith by organizers of the purported harassment campaign; evidence that the organization has already provided the requested documents to a member of the purported harassing group; and a demonstration by the tax-exempt organization that it routinely provides copies of its documents upon request. (d) Harassment determination procedure. A tax-exempt organization may apply for a determination that it is the subject of a harassment campaign and that compliance with requests that are part of the campaign would not be in the public interest by submitting a signed application to the district director for the key district where the organization’s principal office is located (or such other person as the Commissioner may designate). To my knowledge, Gospel for Asia has not requested any such determination. You can read the rest of the procedure at this link (page 91). Let’s make this very clear. There is no harassment campaign. GFA did not try to work with me as one GFA representative said according to former donor Jimmy Humphrey. There is no reason in the public interest either here or in India for GFA to hide information or fail to answer questions about discrepancies in financial reports available freely to the public. There is no reason in the public interest for the ECFA to advise their member organizations not to talk to me or any other writer. It confirmed that GFA had sent cash with individuals travelling to India, but said that it had “stopped this practice entirely, and is working with legal counsel to determine appropriate remedial measures, if any”. If the practice is legal and cleared with auditors Bland Garvey, why check with lawyers? Maybe there are good answers for every question. If so, the public interest demands that GFA answer them. If not, then whose interest is served by silence? Author Warren ThrockmortonPosted on August 6, 2015 Categories Charity, David Carroll, ECFA, Gospel for Asia, K.P. YohannanTags Evangelical Council for Financial Accountability, Gospel for Asia, IRSLeave a comment on Gospel for Asia and ECFA: Is Reporting Information About An Organization Harassment? 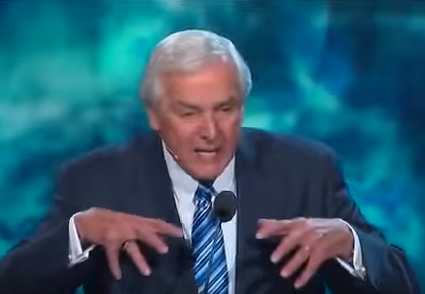 Two former staff members of Faith Christian Church in Tucson AZ provided more details about the procedures church leaders told members to use to drive out rebellion from infants. The Arizona Daily Star reported the procedures described by former member and staffer Rachiel Morgan. According to the Star report, church pastor Stephen Hall taught members to spank babies as young as 8 weeks if they raised up their heads while laying on their stomachs. Wanting to learn more about this claim, I spoke today with Rachiel Morgan. She told me that the techniques were taught in small groups by the elders and that her ex-husband was exhorted to spank his six month old baby in front of church elders to determine if the spankings were hard enough. When putting the child down, if the child lifted his head, you were to push his head down and say “no” firmly. If he lifted his head again, you were to spank him on the backside with the rubber eraser end of a pencil or a cardboard tube from a clothes hanger. You were supposed to strike the baby hard enough to make him cry. You repeated this process until the baby complied, usually by falling asleep. I wrote the email provided by Faith Christian Church to allow them to give their side or to rebut these charges but there has been no answer. Morgan and Phillips described other concerns including financial ones with the ministers of a 400-500 member church getting six figure salaries while most staff were living off donations which had to be shared with the church leadership. Membership in the Evangelical Council for Financial Accountability was used by campus non-salary staff to raise money for the church. Morgan and Phillips knew of no investigation on the part of the ECFA; according to the former staffers, the church pastors gloated about the credibility they had due to membership in the ECFA. Yesterday, prior to Mark Driscoll’s resignation announcement, Warren Smith posted an article at World magazine which summarizes many of the controversies surrounding Mars Hill Church. In it, Smith tells of statements made by Dan Busby, president of the Evangelical Council for Financial Accountability about Mars Hill. ECFA’s only public relations contacts are its President (or his designee) and Board Chair. While they will protect confidential and proprietary information, they will communicate publicly that a Compliance Review is in process or has been completed, what the Standards of concern are or were, and the final decision once the Compliance Review has been completed. Another page (which is also now missing – see cache) promised that all allegations which involved their guidelines would be investigated. I have raised several issues about Mars Hill’s lack of compliance with ECFA guidelines and the ECFA has never suggested mediation. All I have gotten is an assurance that everything is as it should be without explanation. I don’t know of anyone who has leveled a complaint with the ECFA who was pointed to mediation. Since I raised the issue of a public statement with Dan Busby, there has been no response from the ECFA except to purge two pages from the ECFA website. I know of no direct response to the hundreds of people who have signed the ECFA/Mars Hill petitions which request increased transparency from both groups. It is amazing that people would have to beg for an organization to live up to its name. I don’t understand the approach of the Evangelical Council for Financial Accountability to the controversies surrounding Mars Hill Church. Two petitions signed by hundreds have called on the ECFA to address financial accountability at Mars Hill Church. Numerous people, including many former and current Mars Hill members and donors, have written the ECFA asking for answers regarding Mars Hill’s Global Fund. I have written several emails requesting on the record comments about Mars Hill. Recently, silence is the answer. According to Justin Dean, the ECFA examined the dealings of Mars Hill Church regarding the Global Fund. Is this true? And did you communicate the results publicly? If so, where? Mars Hill spokesman Justin Dean had made this statement about the ECFA and the Global Fund as a part of a conversation with Alex Terry which is reported in a post on Monday. Then, yesterday, a commenter let me know that the Complaints page is no longer available. The Google cache of the page is still available and I have the page saved. I wrote to ask Dan Busby why the page was removed. No answer as yet. Standards that are not respected by members or that are violated – whether through ignorance or intentionally – and go unenforced lose their effectiveness in demonstrating God-honoring ethical practice. Just as ECFA’s Standards stress members’ integrity and honesty in action and in communication with the public with certain obligations of disclosure, ECFA will conduct itself with the same requirements when communicating to the public regarding compliance matters. Unfortunately, the ECFA has not communicated on this matter. If the ECFA has no intention of commenting regarding Mars Hill, then we can only assume the Board found no reason to investigate. In light of the evidence surround Mars Hill Global, that finding would be troublesome. On the other hand, if the organization has investigated as Dean implied, then it would be good for the organization to address the many emails, call, petitions and other clear concerns raised by members and former members of Mars Hill as well as other members of the public and the media. The Mars Hill/ECFA petitions are here and here.